When you are practicing first thing in the morning, a cold shower can be invigorating and help to wake you up, while a hot shower can help to warm up your muscles and get you ready for practice. Either way, a shower helps to physically prepare you for your practice. For similar reasons, always wear clean clothing and keep your mat clean for practice. Not only does it feel better to have a clean mat and a clean space, but it shows respect for the practice (and your fellow yogis). Keeping your gear clean takes time and effort, but it’s better than when something gets ruined because it’s just absorbed too many odors. It can be tough to get those smells out (if you know a way, tell me! ), so definitely take the time after practice to air out and wash wet clothing and mats. In the practice room, keep your voice down and conversation to a minimum. When we practice yoga, we are cultivating pratyahara (or withdrawal of the senses). This is one of the reasons why poses have drishtis, to discourage the students’ attention from wandering. This is also a reason that we don’t play music during Ashtanga practice, as well as why the class isn’t led with lots of descriptive vocabulary. The quietness of the Mysore practice is intended as a tool to help the student go deeper inside. By following the breath and not listening to suggestions about what the pose should “feel” like (like in led class), without music, or poetry, or conversation, the student is left to have their own experience and, ideally, to learn more about the self. Be mindful of where you place your mat and make space when you can for others who enter the practice room. I always appreciate it when students place their mats in the established rows and, as the practice space fills up, make room for more mats. Ideally, we try to keep the practice on our own mats as much as possible, but the fact is that some postures and vinyasas are going to take you beyond the four edges of your own mat. When this happens, just slow down, check your surroundings, note where the people around you are, and then go forward carefully and safely. Building on this, keep clutter around your mat to a minimum. Especially if the room is crowded, things like purses, phones, and (my personal pet peeve) eyeglasses often create obstacles for your teacher when walking around the room, as well as for the other students around you. Most rooms or studios will have shelves or closets for your belongings, so you don’t have to worry about them and nobody else does either. Listen to the teacher, within reason. When you are practicing with a teacher or attending a workshop, recognize that the teacher is there to teach you, and that you signed up for it. Listen respectfully to what the teacher has to say and, if it sounds reasonable to your body, go ahead and give it a try. If you want to give something a real try, commit to practicing it that way for a few weeks and see what the results are. That said, if you believe a teacher’s suggestions are hurting you or may hurt you, don’t be afraid to say so. A good teacher will take this as constructive feedback and grow from it. Trust that you know your own body better than someone else, and make decisions about your practice based on this knowledge. If you are dropping in as a visiting student at a yoga shala, introduce yourself to the teacher, tell them what you practice and what injuries you have (if any), and expect to do primary. A lot of teachers won’t mind what series you practice, but it’s good to ask as a courtesy. Personally, to be on the safe side, I always do primary when I am practicing with a teacher for the first time. Not so much because I’m worried about disrespecting the teacher, but more so because I’m worried about getting an adjustment that doesn’t work for my body in a more intense posture. I suggest you and the teacher “date” a little. If you hit it off, maybe consider doing a more advanced series next time. If you are attending a led primary and you normally don’t finish primary series, talk to the teacher about how you should proceed. Again, this comes down to house rules. I know some teachers who will encourage students to experiment with the full sequence and I know some teachers who discourage it. I typically let it be up to the student. Regardless, to avoid miscommunication the best thing to do is to check in with the teacher who is leading the primary, give them a brief synopsis of what you practice and what you are comfortable with, and then go practice. And finally, the dreaded etiquette around room temperature. Speaking from experience, there is absolutely NO temperature that is going to suit everyone. It’s fair to ask the teacher to adjust the temperature; it’s also fair for the teacher to say no. Don’t adjust it without asking, and bring layers so that you can control your own body temperature as much as possible. If you are overheating, slow down and perhaps skip vinyasas and try to find a cool spot. And be sure to take a longer closing sequence. If you are cold, breathe stronger, stay on the vinyasa as much as possible, and do extra sun salutations. In general, use common sense and the same consideration you would in the rest of your life, and your Ashtanga etiquette should be on point! Join the waitlist for my Primary Series Interactive Online Study. Coming January 2019! Want to try Ashtanga now? My Intro to Ashtanga course is on sale! Save $20 at checkout with coupon code HELLOASHTANGA. 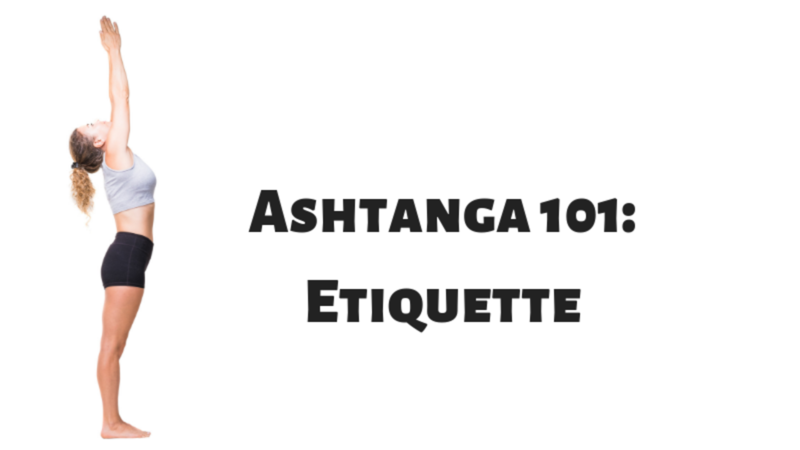 Ashtanga Essentials FREE 5 video email course. Sign up here.